Khoo Sui Hoe was born in 1939 in Kedah and is one of Malaysia’s foremost artists who graduated from the prestigious and highly reputable Nanyang Academy of Art in Singapore. He also studied in the United States where he obtained his education through the Pratt Graphic Centre in New York back in 1974. 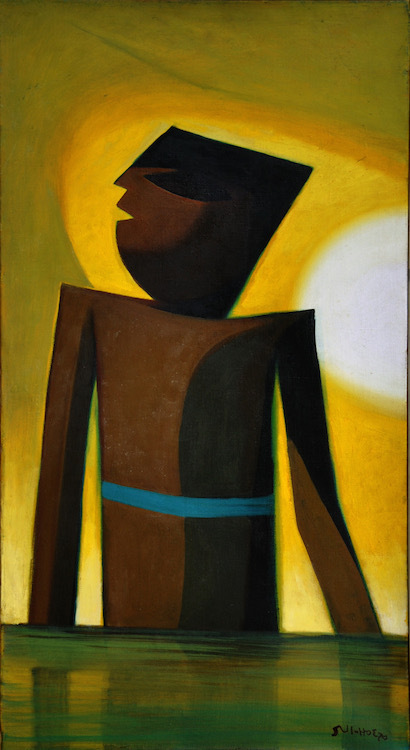 Figure in Day Light shows a tough, solid figure looking up high and mighty for the coming day, represented by the bright yellow hue background. Where his artworks are concerned, Khoo Sui Hoe’s is a master of abstract and using colourful tones, which one can see that such style and technique of art expressions come through with manyyears of experience.